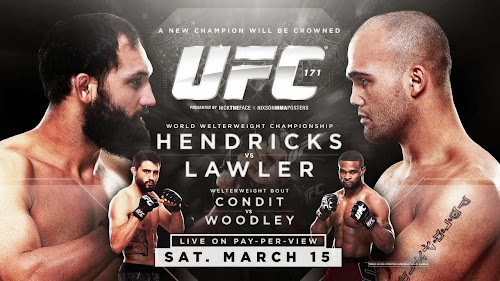 UFC 181: Hendricks vs. Lawler II is an upcoming mixed martial arts event to be held on December 6, 2014 at Mandalay Bay Events Center in Las Vegas, Nevada. UFC 181 will be the organization's 300th event and was expected to be headlined by a Middleweight Championship bout between the current champion Chris Weidman and top contender Vitor Belfort. However, on September 22, it was announced that Weidman had suffered a broken hand and the bout was again rescheduled to take place at UFC 184. The new main event will now be a Welterweight championship rematch between champion Johny Hendricks and number one contender Robbie Lawler. Their first fight at UFC 171 ended in a unanimous decision victory in favor of the reigning champion. This is the video replay soon of UFC 181: Hendricks vs. Lawler II.